Warehouse Robotics: Are Robots the Future of Food Applications? In the 1960s, when The Jetsons made its cartoon debut, robots were a thing of the future. The idea that automation could permeate so much of our everyday lives seemed far-fetched and out of reach. Today, robotics are an ever-present reality. Advanced technology has given rise to equipment and processes that have transformed nearly every industry, and the food and beverage sector is no exception. Now more than ever, it’s important to understand how warehouse robotics could have a major impact on your own operations, machinery and setup. Flexible film is essential for any company that needs to package consumer and institutional products, especially for industrial applications. Exceptional flexibility is key to protect, market, and distribute a vast array of products without damage. From ensuring food safety and extending shelf life, to providing even heating, barrier protection, ease of use, resealability, and superb printability, the packaging industry continues to advance with flexible packaging offerings at an unprecedented rate. The benefits of flexible packaging cannot be overstated. Lightweight and easy to open, carry, store, and re-seal, flexible packaging extends the shelf life of many products, especially food, and has a positive sustainability profile. If you haven’t switched over to flexible packaging yet (or you aren’t at least considering it), it’s time to stop and think about why. Flexible packaging has been at the forefront of packaging innovation for decades, and its popularity continues to explode across a myriad of product industries. Not sure why this packaging solution has become such a big deal? You might be missing some critical facts and insights that shed a bright light on the subject. The use of flexible packaging and flexible films is growing across almost every industry, as manufacturers of consumer goods discover the innovation’s valuable advantages. Flexibility in a packaging solution, in and of itself, is reason to consider the option. But there’s even more benefit to glean from flexible packaging film. From customization and versatility to cost savings and consumer appeal, it’s difficult to find a reason not to employ this form of packaging. Research shows that demand for flexible packaging in the U.S. is expected to rise 3.2% per year through 2021. From cost savings to marketing adaptability, the advantages of this packaging option are becoming more widely recognized across an array of industries. The food and beverage sector is no exception, as food brands adopt flexible packaging for more and more types of consumer packaged goods (CPG). Shrink film is a packaging material made up of polymer plastic film. When heat is applied it shrinks tightly over whatever it's covering. Shrink wrap and shrink film are very versatile materials, and can be used in a large variety of packaging applications. Some common uses of shrink wrap are for wrapping food, gift baskets, boxes, toys, books, soaps, etc. 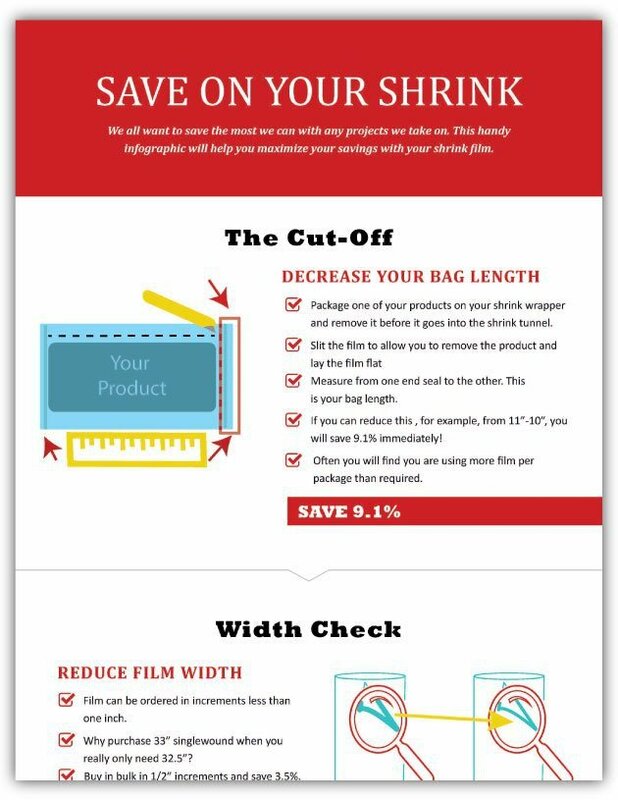 There are many reasons you may want to utilize shrink film for your product packaging. Along with being lightweight and durable, it keeps your products safe from outside elements, increases shelf life and tamper-proofing and makes your product shine! A brand’s commitment to adopting environmentally conscious practices has become increasingly important to today’s consumers. As more people recognize the need for environmental awareness, shoppers are showing a preference for companies that take steps to reduce their environmental impact and ecological footprint. So where does sustainable labeling fit into the mix, and how can it help boost trust in your product? Here’s what you need to know. As the need for more packaging rises, it’s important to remember what that means for our environment. Because of this, many companies are starting to use or create a deadline for sourcing more sustainable packaging materials to ensure that the footprint they leave once the packaging becomes waste is minimal. For many companies, selecting a packaging materials supplier can be a daunting experience, mainly because most manufacturers are unaware of the complexity involved in modern packaging. Whether you are a small to mid-sized company venturing into new product packaging or a large, established organization looking to change suppliers, the research process of finding the right supplier is pretty similar. This post will help provide insight on what to consider when trying to find a packaging materials supplier as well as the right questions to ask when speaking with sales representatives. Augmented Reality, known as AR, is a concept where we use technology to superimpose virtual information on to the world that we see. Gaming is one popular application of this technology. Did you know that product packaging is another? In fact, augmented reality has incredibly useful applications in the packaging industry. This fascinating technology can be used to enhance product packaging, improve brand loyalty, attract new customers, and stand out from competitors. The best part? Often, all you need is a QR code or a bit of minor tweaking to your package design. When it comes to choosing the right packaging material for your product, you can’t go wrong by paying close attention to the details. After all, packaging may just be one of the biggest factors in making your product a success. The right packaging not only attracts consumers, it will keep your product safe in transportation and keep it fresh. This reinforces the quality of the brand and item when customers know they can count on a fresh item from when it hits the shelf to when it’s in their hand. Reliability is a key component when choosing any kind of machinery or mechanical device. When hundreds of thousands of products and a business’ entire distribution process is on the line, reliability becomes even more important. Considering which machines or manufacturers are the best is a subjective process. What is best can mean one thing for a smaller business and something very different for a larger one. Best can also mean different things depending on your specific packaging needs, regardless of volume. If you want to achieve maximum efficiency with your production and packaging strategies, it’s never been enough to operate with a day-to-day, tactical mentality. This short-term mindset will only go as far as helping you accomplish daily tasks and meeting project goals. But in 2018 especially, it takes a much more proactive approach to realize long-term organizational success and achieve the efficiencies that have a lasting impact on your bottom line and growth. From fast-moving consumer and sporting goods to electronics, cosmetics and medical supplies, flexible protective packaging is key material in the supply chain of many industries and products. Combining the best qualities of plastics and films, flexible packaging is a versatile and functional solution that requires minimal materials, production and costs. Sustainability is no longer the future for packaging. It's officially the present state and the foreseeable future in package design and corporate responsibility. Sustainable packaging is not only a better option for the environment, but a great investment; especially for brands that are actively pursuing a positive image in the eyes of the consumer. The main impediment to its speed to growth in the packaging market has been the higher cost that comes along with it, but that's changing. Deciding how to design for sustainability may seem difficult and costly, but it is a worthwhile endeavor that will not only become mandatory in the next decade, but also provide major benefits to brands that adopt it in some form, sooner rather than later. When operating any business, being mindful of costs is one of the key ways to maximize sales potential. After all, creating a competitive product is important, but making that product available to the consumer in a cost-effective way sets successful businesses apart from the competition. Production line automation allows companies to leverage ingenuity and efficiency without sacrificing craftsmanship or quality. With an automated production line, you never have to worry about employees getting sick, you can rest assured that production levels will remain high, and you can feel confident knowing that the end product will be made to a consistently high standard. In the age of the technology boom it's important to take a look at how you bring your products to market. Do you need to consider the boom in e-commerce when it comes to your current packaging designs? Some believe it's necessary depending on your product line and target markets while others are using it as a way to catapult their business by packaging with a new set of eyes and creativity, creating a bond between the consumer and the brand. How has the digital age influenced product packaging? Here's the latest on how digital is influencing packaging aesthetics and how you can too, with research to back it up! Flexible packaging is one of the fastest growing forms of packaging in the industry and it doesn’t look like that growth is stopping anytime soon. Not only is it beneficial to both manufacturers and retailers, but it also has it’s perks for consumers as well. Flexibility is the name of the game, not just in a tangible sense. The options available in the flexible material space are almost endless! Read on to learn why flexible packaging is so innovative and the great perks that come along with transitioning to using it to package your products. There are many different factors you should take into account as you are selecting new packaging machinery for your operation. We dive into the important things you should look for and why. While the costs associated with packaging automation may seem daunting, you may be surprised by how quickly machines can eventually pay for themselves, and then some. With the right strategies in place, an automated packaging process can have a big impact on your financials. As a forward-thinking company with your eyes set on growth, you’re likely assessing every factor that drives your revenue and bottom line. Every year, you’re brainstorming ways to improve in the coming year, and that should include your packaging design. We talk a lot about the various types of product packaging; from materials to design and other ways to make your products stand out for your customers in the retail markets. But why is packaging itself important? If you’ve ever gone through the packaging development process, you know how many variables and unknowns there are to coordinate. Your project can quickly spiral out of control and result in missed deadlines and exceeding your budget. You may also have to hit the drawing board more than a few times to solve problems that inevitably arise. And these are exacerbated when you fail to include all relevant teams and align your perspective to the same goal(s). The majority of segments in the United States’ core economy expanded in 2017, but the growth isn’t expected to stop this year. Anirban Basu, Chief Economist of the Associated Builders and Contractors, indicates that the U.S. economy is set up for continued growth in 2018. The agriculture and food production sector is specifically growing due to rising real wages, low unemployment, low inflation, low interest rates, a rising stock market, and low commodity prices. With surging demand for food, these manufacturers are faced with substantial opportunity to carve out greater market share. Sticking with the status quo won’t propel your business further, however. The majority of food production companies stand to better engage consumers with revamped packaging. Especially if your food packaging is lagging behind the latest trends, the time is now to redesign your product presentation and make the most out of this ripe economy. Are you stretch wrapping your pallets by hand? Relying on manual labor to consistently protect your products in transit may be causing your company to lose money in the long-run. If your products are in high demand and you are cutting it close or even worse, missing your customers requested orders, you may be able to remedy this with automation at your end-of-line. Hand-wrapping pallets is less cost-effective at a certain point while automated stretch-wrapping machinery can save on time, and on costs. The idea of saving money have your attention? Learn more about how to determine when it's time to switch from hand-wrapping pallets to automated pallet-wrapping machinery. Food labeling is a highly scrutinized, crucial part of food product manufacturing. However, it also can be an easily rushed and/or overlooked part of bringing a product to market. It's easy to make simple mistakes no matter how large or small your operation may be. It's also easy to steer clear of any issues when you are well-prepared with a plan and process and when you are working with a supplier that will assist you along the way to launch. Product packaging is important! You've heard this before, and it's still true. If your product packaging isn't the best it can be, it's probably costing you more money than it could be. In honor of helping your brand shine on and off the shelf, here are 6 packaging mistakes that are costing you money and how to remedy them! Gaining market share in any one of the consumer goods and fast-moving consumer goods markets takes serious effort for marketing departments and packaging engineers. Catching the attention of your target market over competition on the shelves or on the web is challenging, and its also very important! Brands with heavy competition may need to try something out of the ordinary, or outside of the box to get noticed. It's true, new packaging machinery does involve some investment. It's not true, however, that you must face a major capital investment decision in order to acquire said machinery. The option to lease packaging machinery may get overlooked, and it's worth giving additional attention when you are planning for growth with your manufacturing or distribution business. Take some care to vet if leasing is an option that will provide you the best return on investment and room to grow beyond your production floor. Here are some considerations to review when you are making your plans for machinery upgrades for your packaging line. When is the last time you took time to review your packaging processes to identify areas of strength and weakness? Have you ever worked with your supplier to perform a packaging line audit? Your packaging line is one of the key components to any manufacturing production. Being aware of the causes of downtime or product damage will place you a step ahead of the game when it comes to selecting what capital investments for your operation will bring you the most bang for your buck. When it comes to packaging design there are a lot of factors that come into play to have a successful product. Product packaging is one of the most important pieces to your brand's success, so it's clearly important to place a high level of planning and thought into your design. As manufacturer or distributor of foods or consumer goods, you may experience growing pains as your business handles increased demand. These pains often include bandwidth limitations and labor issues, and packaging line automation is an excellent place in your production line to eliminate them. Great packaging is a must for anyone producing physical goods. It tells your customers about your company, your product, and what you stand for. Not only do you have to get creative with your packaging, you need to attract your customers and get them excited to buy. When it comes to packaging food, however, there are even more things to consider. DOWNTIME.. It's the bane of any busy manufacturing or distribution floor, and it impacts more than just time. It often comes down to how well you maintain your packaging machinery, aside from the occasional fluke machinery issue. Halloween is coming, and that means millions of Americans are stocking up on candy. Odds are you’re going to be giving out special, made-for-Halloween treats. The thing that distinguishes Halloween candy the most from other candy is it’s packaging. You have got to design a creative package for your retail product during the holiday seasons! Most businesses are planning for the Christmas and winter holiday pushes right now and Halloween packaging has already been signed, sealed and delivered. That doesn't mean the tips we discuss below can't be helpful for any holiday or seasonal packaging promotions. so use these ideas in your planning for the upcoming holiday season, and keep them in mind for Halloween 2018. The National Confectioners Association has reported 65% of consumers will pick themed packaging over plain packaging during the Halloween season. Every year millions of people are inspired by Halloween product packaging at the point of sale, and more and more manufacturers are taking advantage of seasonal packaging. You will see more limited edition packaging tailored for Halloween and other holidays as digital printing and technology make shorter runs economically feasible. This post will will walk you through some tips for capitalizing on your Halloween themed packaging so that you can get your piece of the 8.4 billion spent on the holiday this year and next. Can You Answer These 5 Questions About Your Warehouse Management? How effective is your warehouse? Does it improve or worsen your efficiency? If you don’t know, there are many other warehouse managers in the same boat. A lot of manufacturing and packaging companies don’t have the right data to properly evaluate their warehousing processes. This results in an inefficient warehouse that drains your bottom line. So how can you measure how efficient your warehouse is? Identify some metrics to measure your warehouse’s operations. Set benchmarks for those standards that you need to hit. Here are a few questions you should be able to answer about your warehouse. If you can’t, it might be time to reconsider your processes. When it comes to presentation, labeling your product packaging for the long haul of its lifecycle is no simple task; especially if you are not aware of the many options available and all of the items to take into consideration when choosing a label. We will provide you with some key factors to review when it's time to choose the best packaging label for your product. What Does Your Package Shape and Color Mean To Consumers? Primary and secondary packaging play two of the most important roles in product marketing for brands large and small; from food, retail, and consumer goods to industrial and the exploding world of eCommerce, it's a brands voice, and its first impression to a consumer, you've got to make it count. Did you know package shape can influence a purchase? Shrink wrapping is an easy process that only requires two things: the right kind of plastic wrap and heat. With just a roll of shrink wrap and a heating source, you can waterproof, weatherproof and tamperproof just about anything you have. Since there is no restriction on size to shrink wrap items, you have a way to protect even your bulkiest of items. But even this great packaging solution has a few potential hiccups. The demand for consumer-centric, personalized packaging is growing by the day. Though it's making things exciting in the marketplace, it also presents many challenges in the process of creating and maintaining printed food packaging and labeling, especially if you aren't digitally printing. There are a few key items to consider that can positively impact the costs and time required of packaging workflows. Learn how to become more efficient as the tides of the packaging world ebb and flow, and how to keep up with speed to market with these tips from our experience in packaging and labeling for the snacks and confectionery markets. If you have a start up business in retail and consumer goods markets, you have plenty of hurdles to overcome as you get your product off the ground. According to an article from Fortune.com and featured by Forbes, 90% of start ups fail. The reasons so many fail are varied and range anywhere from lack of need in the market, lack of funds, the wrong team, or simply strong(er) competition; one way to keep your business on the right track is finding the ideal product packaging, processes, suppliers that will help guide your business and your product launch to success. The last thing that you want to worry about is your product leaving your business or facility and ending up at it’s destination damaged or completely destroyed. Unfortunately this isn't a rare occurence. No matter if it's your fault due to packaging issues or someone elses as it's in handled transit, it's a representation of your product and brand to the person or business receiving it. In fact, pallet loads can even be turned away at the distribution center, costing thousands for one unit. This can not only cause significant delays in delivery, but also potential damage to your business relationships. When shipping damage occurs you then have to ship out a new product to replace the damaged goods, which can end up costly for your business . The process itself of even looking into where the damage occured or who is liable can be grueling in itself. Additionally, figuring out if the cost will be covered by the carrier or damager and whether they have the insurance to cover it can be a whole other issue in itself. Even if the third party has the insurance to cover it, damaged goods claims can take a bit of time and in most cases, it may be easier to take on the cost yourself for the time spent on monitoring the claim or waiting. Catching the eye of a consumer in a retail environment can be quite a challenge, but imagine if you could stand up, and out, from the competition? With an in-store off the shelf stand-alone point-of-purchase display you can get your product in front of the right people before the competition even has a chance to dazzle them with their extravagant packaging design. Keep reading to learn more about point-of-purchase (POP) displays and how they can help you to smash your next marketing campaign. Tamper-evident packaging (TEP) provides many benefits to brands and businesses in any industry, the most evident being security. If you are in pharmaceuticals, tamper-evident packaging is a requirement, in others it provides security throughout the supply chain and purchase by the consumer. It's important to understand what TEP is, how it can benefit your business and the differences between tamper-evident and tamper-resistant packaging (TRP). With tamper-evidence, its also important to think of the consumer when selecting your packaging materials for product security. As you probably already know, there are many factors that come into play when you are packaging food products, and we understand that generalizing food as a category really broadens the scope. With numerous types of foods, each with different regulations and guidelines that must be followed it can be an overwhelming topic. Which is why we're covering the top six 'need-to-know' topics that any type of food manufacturer should know for their product packaging. The summer sun brightens our days and keeps us warm, but it can take a toll on your product packaging. If you manufacture temperature sensitive goods such as chocolates, produce, flowers, meats or other perishable items including pharmaceuticals or certain health care products, it's imperative to have procedures in place for proper handling of your packaged goods in any type of climate. In order to keep damages and repackaging to a minimum, we've gathered some tips to guide you during the dog days of summer. When it comes to void fill for shipping protection, air pillows are effectively the 'new guy in town'. The ecommerce giant Amazon has led by example and made the switch to air pillows thanks to their ease-of-use and low cost, not to mention they are more environmentally-friendly when compared to alternative forms of void fill. Consumer frustration over complex, bulky and difficult to open packaging is another reason that air pillows are growing in popularity. Your warehouse, plant floors, and production KPI's will also find the small footprint of storing pillows to be an added benefit when space is limited. We’ve listed the top 5 reasons why air pillows can benefit businesses of all sizes. The products you manufacture for consumer purchase must be designed with proper planning and research to provide the most value with the lowest cost of production. This means that the packaging you go to market will require attention to detail in order to gain visibility in the marketplace as well as to convey the value that the product holds. The packaging materials themselves and the visual appeal are vital in grasping consumer’s attention, making the sale, and gaining repeat business. Think more of product packaging as an investment - rather than an added cost. As it stands in 2017, we can’t avoid plastics – they’re everywhere in our lives from our kitchen appliances to the doctor’s office. Contrary to popular belief, all plastics aren’t the same. There are many types of eco-green packaging options comprised of sustainable plastics available today for all types of products, and they can hold the opportunity for huge savings in your business operation. As a Brand Manager, Packaging Designer, or Production/Plant Manager, your primary focuses are safe and effective packaging as well as your bottom line. Packaging affects so many aspects of your product line, and with that, your business. Growth, revenue, and reducing costs can all be tied directly into the way you package and ship your products. So, while your industrial packaging products need to adhere to certain standards of quality and safety, how efficiently they are executed is just as important to your business. Your packaging makes a statement about how you do business. Here is an easy, three-step plan to master your packaging and make a great impression. If you had to make a list of the things that are most important for a product's success, packaging would undoubtedly be near the top. According to a 2015 Cone Communications and Ebiquity Global CSR Study on Consumer Trends, 84% of respondents said they were very likely to buy a product if they thought it had social or environmental benefits like green packaging and related materials.But green packaging itself is not the trend—it is merely the catalyst to a series of new perspectives on packaging. There are a number of key green packaging material trends that you should definitely watch out for in 2017. Over the years, product packaging as a concept has evolved from "just something you have to do to get your product on the shelves" to a pivotal part of marketing efforts and the true experience you offer to your customers. When done properly, product packaging can lead to a deeper, more loyal connection with your audience and increased sales. When it comes to modern-day product packaging design, there are a few core packaging rules every business needs to know. While focusing on the quality of your products is important, proper packaging should be given just as much attention. The packaging will be every customer's’ first impression of your product and must also ensure the safe delivery of the product. Form, function, color, and sustainability are vital to proper packaging design. We’ve picked out a few outstanding examples of innovative packaging design to serve as inspiration. Product packaging design can have a significant impact on your business. Keep in mind that design doesn’t just refer to eye-catching visual elements such as your company logo. It also includes the types of materials you use to package your products, the shape of your packaging, and the functionality of the packaging throughout the purchasing journey. Certain packaging elements, such as stretch wrapping and shrink film, provide important benefits that can boost the success of your business. Product packaging serves several important purposes. It protects items during shipping, makes storage easy and, ideally, presents your product in a way that will entice customers to choose it over the competition. Many manufacturers and producers underestimate the negative effect that poor packaging design can have on sales. As a consumer, you may not realize the role a perfect packaging design plays in your purchasing decisions. The package must convey enough information about a product to pique your interest and inform you of its purpose—all without being overbearing. As a retailer, you want your packaging to promote your brand, protect the product, and show your customer why your product is perfect for them. Good packaging is an investment for your product and your brand. “Out of control” packaging is a broad brushstroke encompassing many different problems. Product manufacturers deal with an array of packaging issues that can stem from complications with machinery, marketing, shipping, and more. To avoid as many of these pitfalls as possible, brand managers need to have input from their marketing, manufacturing, and engineering teams. Packaging is often the first impression customers have with a product. It is important to consider exactly what your packaging is saying about your product. Since the new year is traditionally a time for reinvention, here are some interesting packaging trends to consider for 2017. This past October, Walmart held the Walmart Sustainability Summit and launched the new Walmart Sustainability Playbook. As a manufacturer of consumer goods, see how you can fall in line with the Walmart plan and how flexible packaging can provide you with increased sustainability in the year ahead and beyond, whether you are directly affected by Walmart or not. Here are the top 7 products and package designs that won (and failed) like champions Getting a product to be noticed in the vast sea of retail goods at the market can be challenging and companies have tried some pretty outlandish products and package designs to gain consumer attention over the years. I've created a list of the top seven products and package designs I have come across this year because they are too great, or too terrible not to share. Here is first annual List of Unordinary Packaging. Turn the high cost of damaged goods around in 2017 with the right stretch How much has product damaged during shipment cost your business in the past year? Busy Supply Chain, Plant, & Operations Managers must take into account the many factors that make up the true cost of these damaged goods while finding the root cause to stop the bleeding. Understand the actual costs of damaged goods and where stretch wrap fits in to the remedy. Tis' the season for reminding everyone all the things we are grateful for. As a packaging company with a blog, we have an opportunity to give thanks outside the general box of family, friends, and food. In addition to these things that keep our business successful, we are thankful for a few more things, including you. Clean Machines, Packaging, and Consumer Expectations in 2017 Pack Expo 2016 is a wrap, no pun intended. Beyond telling you how amazing the weather was in the Windy City for the show, we have a few worthwhile takeaways to share. Vertical form, fill, seal machinery dominated the floors; Pouches are continuing to grow in popularity and are innovating how brands go to market, and recyclable, environmentally-friendly, & compostable films are becoming resilient and competitive to other films. Plus, consumers want them! It's The Packaging Supplier Behind It That Matters While attending Pack Expo this past weekend, shrink film brands came up many times creating some heated conversations. Through all of the talk, one piece of integral information for Consumer Goods companies prevailed: Shrink film is shrink film. Nevermind what brand of film your packaging your product with, what truly makes the difference is the supplier you work with. What's Going To Sell Your Retail Goods for Valentine's 2017? Making Your Retail Package Worth The Buy This Valentine's Season For most of us, Valentine's Day isn't even a distant thought yet, but for candy and confectionery companies, 'tis the season of love! It's time to get your valentine's packaging in order, get your designs laid out, and get your promotional plans finalized. How are you going to make your goods a hit on the shelf (and the web) for the 2017 Season of Love? What Does Your Package Color Mean To Consumers? The Industrial Packaging team is preparing to launch an e-Commerce storefront that is unlike any other in the industry. Flexible protective packaging will soon be available to order and have shipped wherever you need without even picking up a phone...we want share our excitement (and a pre-launch discount)! Manufacturers can see increased revenue in a stagnant economy with outsourced fulfillment and contract packagers What are manufacturers of consumer goods doing to grow when the economy seems to be stagnant, at best? Outsourcing. The benefits to outsourced fulfillment and/or packaging include increased revenue and focus on core competencies, as well as decreased labor and overhead expenditure. Copyright: lucadp / 123RF Stock Photo The internet is shaking up the way manufacturers and distributors go to market with their products, and its only going to become more prominent as the world advances technologically. What does this mean for you and your customers' brands in terms of supply chain and packaging? Benefits and Safety in Food Production Static can cause some serious problems in many different manufacturing and production environments. In foods, fine powders and granules like sugar and flour can not only cause an unattractive coating on your packaged goods, but it can also be quite explosive. Small particles like these may generate a static charge and have a potential to ignite. Utilizing anti-static plastic packaging can help to mitigate product damage and safety issues. Is your packaging design stale? When is the last time you even looked into changing your retail product package design? A lot has changed on store shelves in just the past few years, from innovative use of materials used in packaging to the ever-changing consumer trends that gain the most attention. What can you do without breaking the bank if you've found yourself dressing your products in last decades' attire? Our friends over at Lantech have been busy this year launching new machines and programs to assist the busy production facility in operating more efficiently. They've done it again with their latest machine launch, the ProfitPack. The new casing station perfectly combines automation and necessary human judgment for case erecting, packing and sealing.